Fig. 1. iNaturalist photographs of Eremalche rotundifolia, five spot, flowers in various stages of bloom, from an opening bud at left to fully open flowers to closed flowers. The time of observation is given for each photograph in both standard time and daylight saving time. Click on the pictures to go to the original iNat observations of each flower. 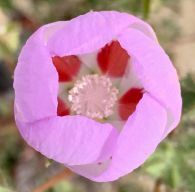 Many people, especially early risers, are disappointed when they see a five spot plant that is apparently in full bloom, but the flowers are not open. 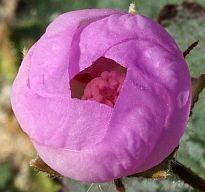 The reason is that this plant only opens its blooms between about noon and 4 p.m. PST (1 and 5 p.m. PDT)! Fig. 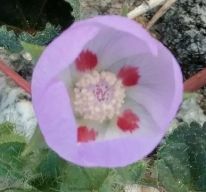 1 shows an analysis of flowers photographed from the Borrego Desert at iNaturalist in the 2018 to 2019 season, from the first flower on 24 December 2018 to 9 March 2019, when I did this analysis. 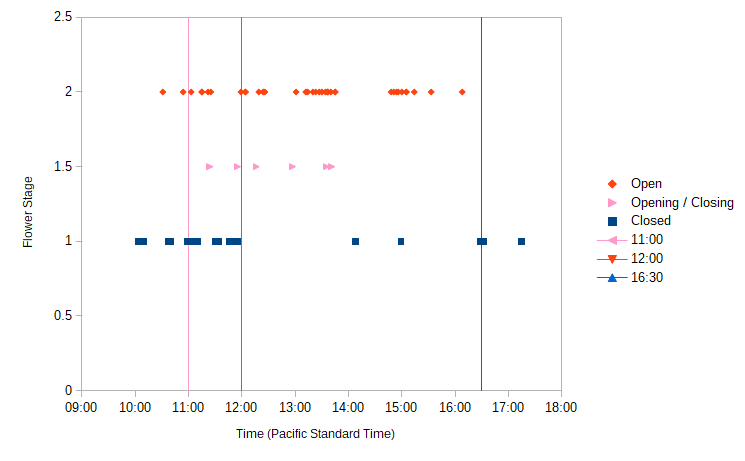 This entire period was during standard time, avoiding confusion between standard time and daylight saving time. The results are quite consistent. With just three exceptions, all observations between noon and 4 p.m. show open flowers, along with a single opening flower near noon. The two closed-flower observations between 2 and 3 p.m. might have been flowers that were in fact swelling buds that were not yet ready to open on that day. All observations before 11:00 a.m. show closed flowers, with only one exception. It is possible that photos showing open flowers before 11:00 a.m. may have been manually opened by the photographer. Such behavior is a common occurrence, since photographers really want to photograph open flowers showing the spots. 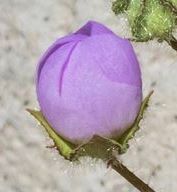 The earliest open flower at iNat is in fact a damaged one, which could have resulted from a manual attempt at opening it, or could have resulted from having a single defective petal. But it could be that other factors can cause some blooms to open before noon, such as the temperature and amount of sunshine. Observations between 11:00 a.m. and noon are mixed, with some photos showing closed flowers, some photos showing opening flowers, and one photo of a somewhat ratty-looking flower that looks unusual, which maybe have been a finished flower that never closed the previous evening. One wonders why a plant would have its flowers open for so few hours a day, but this species is not terribly unusual for that trait. Other plants that behave similarly are Calandrinia ciliata (=C. menziesii), red maids; Fagonia pachyacantha, sticky fagonia; and Uropappus lindleyi, silver puffs, and its close relatives. I don't know how long an individual flower lasts, but one source says Petals close at night, reopening the next morning, and the leaves move during the day to receive the maximum amount of sunlight. One complication in investigating the reason behind this unusually-short open flower duration is that apparently no one knows who the pollinator is for five spot, or even if it requires a pollinator. You'd think such a showy flower, with spots to guide insects, would be trying to attract a pollinator, but no one I know has ever observed a pollinator on the flower. The only insect I could find that was in the flower are little spiders. This is also the only picture I know of that shows such beautiful prime-time stamens, with purplish filaments and those unusual pink-purple dots near the base of the filaments. Presumably, there must be nectaries located below the red spots, but I can't find any mention of them. Fred Melgert. If the pollinator is very small, they might even enter if the flower is almost closed. Kate Harper. A closed flower conserves resources, so my first guess is that noon - 4 p.m. is when its primary pollinator is most active. This would allow for pollination using the minimum energy/water/resources. James Dillane. Possible strategy: Produce the most attractive flower, the most powerful pollinator magnet. It would be attention-getting with a big nectar/pollen payoff, and very expensive for the plant to maintain, especially in a dry and/or windy environment. But if they are are really good at getting pollinated, they only need to be open at the time when the most, or perhaps the most effective, pollinators are on the wing. If the flower is the preferred nectar/pollen source, the insects would learn to ignore all other flowers for this brief portion of the day. The rest of the time they are closed to conserve water and/or recharge. Perhaps they are also avoiding poor pollinators that take the pollen but don’t do the job. And the scent may not be in the air long enough for flower-eating crawlers to find the flower. James Dillane's suggestion about the flower closing to avoid wind is very interesting! Noon to 4 p.m. is in general the least windy part of the day, and a five spot flower is probably very vulnerable to wind when it is open, and not so much when it is closed. So its opening cycle may have nothing to do with a pollinator at all! I thank iNaturalist and the photographers who took these pictures, especially Fred Melgert and Carla Hoegen, that made it a piece of cake to do this analysis.